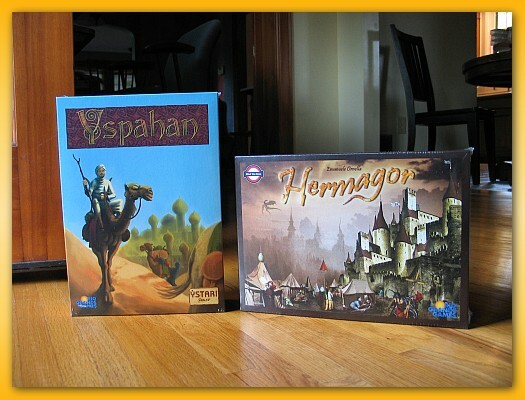 My order mixup from Game Surplus arrived today so I packed up Hamburgum and Ys and I’ll take them to UPS tomorrow. Part of me doesn’t want to part with them but with six new games staring me in the face I really can’t complain about send back two more. I pulled out La Citta tonight and set up the board to walk through some sample turns to get a feel for the rules. I really enjoy learning how to play a new game. There’s just some inner portion of my psyche that gets a kick out of seeing how all of the parts play together. I like exploring the mind of the designer through the end result. For some, I’m sure, learning a new game by reading the rules is pure torture but I’m weird that way. I’ve even been known to download the rules to games I don’t own just to see how they work. Like most things, reading rules takes practice and over time it gets easier and easier to absorb what would have otherwise taken hours of concentrated effort. La Citta is a territory building game. The board is made up of paths that wind through tiles depicting wheat, stone, and water. 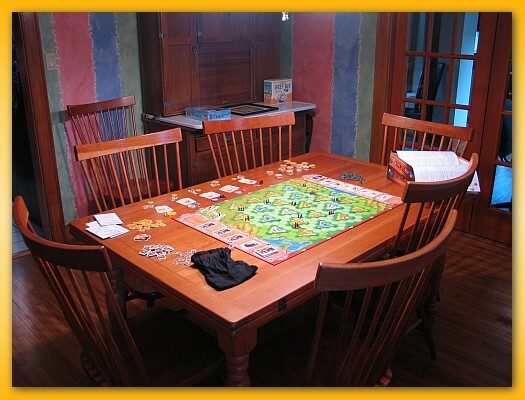 Players seed the board with castles and play progresses by building buildings next to your castle expanding your territory along the pathways leading to connectivity with high valued areas of stone (which produced gold), water (which keeps your people healthy), and wheat (which keeps your people fed). Little plastic people inhabit your city and represent the growing population of your city. At the end of each round, players must be sure to have built buildings in areas that will produce enough food to feed their ever growing population. When cities encroach one another, some of the population may defect to cities that provide services that the people choose are important for that round. However, if you grow too fast you won’t be able to feed your people (stiff penalties in the following round if you can’t) and if you lose too many people, your buildings fall into disrepair and your cities decay (weakening your position on the board). I’m really excited about getting this game to the table. I think many in the group will like the ebb and flow of the population growth and the numerous mechanics you need to juggle to pull off what you are trying to accomplish. 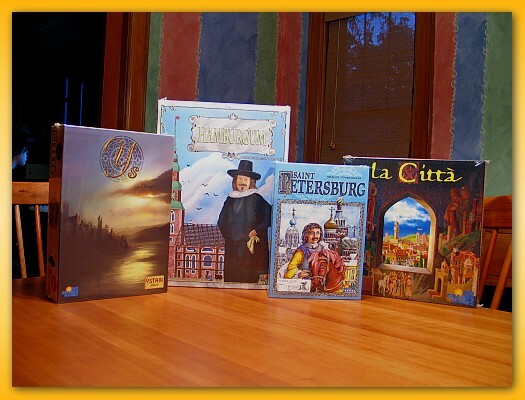 I had a gift certificate for Game Surplus burning a hole in my pocket so I ordered four games: La Citta, Saint Petersburg, Hermagor, and Yspahan and when I got home the box was sitting in the living room just waiting for me. Unfortunately, as you can tell from the image above, two of the games were mysteriously missing and as a substitute I received a copy of Hamburgum and Ys. Both games are highly rated on BGG and I’ve thought about obtaining a copy in the past but not on this order. I sent off an email to Thor at Game Surplus and we’ll see how it goes. Double unfortunately, both Hermagor and Yspahan are now sold out at Game Surplus due to a free shipping event today that brought in a lot of new orders. Edit: Just heard back from Thor. He’s crediting my account for the shipping of the original order, he’s sending out copies of Hermagor and Yspahan, and a shipping label to send back Hamburgum and Ys. In the Shadow of the Emperor and Winner’s Circle arrived in the last few days and I’ve started slogging through the rules of the former hoping to get to the latter later this weekend. My first impressions of Shadow are good. The rules are somewhat convoluted but the game has a lot of moving parts and decisions to make so it’s difficult to get your head around the game by reading. However, although the game reads as slightly complex it has the feel that play will not be complex. Shadows has a rich theme. 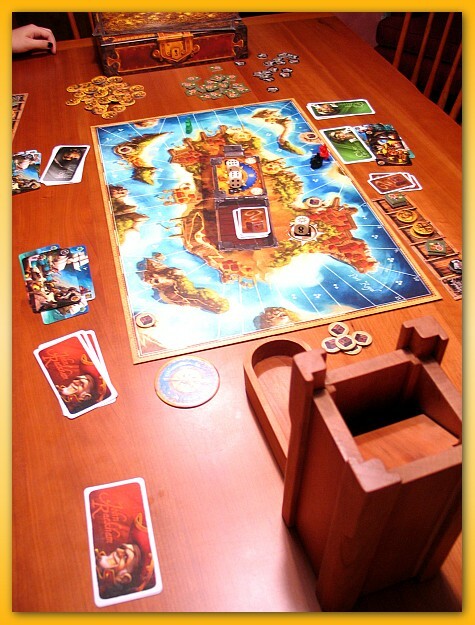 Players vie for retaining the role of the Emperor which grants special privileges. Players allocate barons, knights, couples, and cities to areas of the board (Electorates) and take actions and special privileges of controlled electorates. Allocated “people” then age providing a unique twist on your ability to retain control of an Electorate (aged people are removed from the board). Changes in who controls the Emperor’s seat, negotiation between players for marriages of descendants, obtaining enough votes through strategic placement of people and card purchases, etc. all make for a rich and rewarding game. I’m looking forward to my first game. No if only I can get my group to be willing to slog through a learning game. I also received Winner’s Circle but I’m not up to speed yet on that one much. I traded for the game mostly because I don’t own a “race/betting” game like it and it came highly rated on BGG. The fact that it supports up to 6 players and has a fairly short playing time (60 minutes) I thought it would be a nice change of pace from the standard Euro-fare that can get a little monotonous over time. Time will tell. Unfortunately the box came with a pretty severe crush that appears to have occurred during shipment. The game was not packed with much internal padding and so it suffered the blow as well. It doesn’t appear to have injured the game itself…just the box. That’s the risk you take when trading though. It’s getting a little old not having power now. Supposedly, our power will return tomorrow but I’m not holding my breath. We played Lexio last night by candlelight. That’s the first time Noah and Sophie have played and they asked to learn so I can’t complain about that. Oh, In the Shadow of the Emperor came in the mail yesterday. Unfortunately it was getting pretty dark when I got home so I didn’t get a chance to fondle the bits very much. I’ve opened an Ultimate Trade on Board Game Geek starting with On the Underground with a goal of finding Hermagor. If you, or anyone you know, are interested, take a moment to have a look at what games are currently in the chain(s). The trade attempt closes no later than 7am September 15th. BGG supports a very active boardgame trading system but the software only handles locating and transacting direct one-on-one trades. However, an Ultimate Trade starts with a game and usually a target desired game. 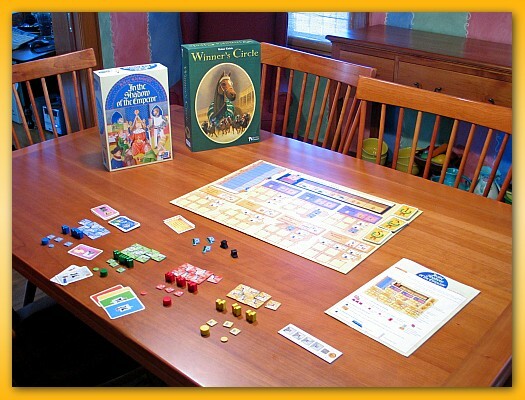 BGG members post entries on the trade list that name what game they wish to receive (a game already being offered on the list) and in turn they offer another game up for trade. If anyone offers up the target game (or a game the OP is willing to take in lieu of the target game) then the trade is complete, the list closes, and everyone simply sends their game to the next guy in line and the multi-step trade is complete. Forks are usually allowed meaning that there isn’t necessarily just one end of the chain. For example, if I offer game A and I’m looking for game D, a person might post that they’re willing to take game A and offer B. For game B, yet another person offers game C making the chain A->B->C. A new person also wants game B so rather than being left out of the loop, they create a fork from B offering D making the chain A->B->D. At this point, since D has been offered (my ultimate goal) I can select the winning chaing (A->B->D) and close the list. The person offering game C is left out of the trade loop. Played Jamaica with Sophie and Noah tonight.